Second part of the RSC dramatisation of Hilary Mantel‘s novels around the character of Thomas Cromwell (adaptation by Mike Poulton). The hurricane is still far from subsiding; the 16th century’s wheels keep grinding on. On the surface, Henry VIII has so far succeeded in his struggles, the annulment of his first marriage, young Anne Boleyn as his new wife, the riches of the dissolved monasteries in his coffers, and in addition, the title as head of the Anglican Church. On the inside, however, dissatisfaction is festering again. Anne Boleyn gives birth to a girl, Elizabeth, and nobody thinks her capable of taking over the crown one day. Male heirs to the throne still fail to be born. An increasingly irritable Anne (particularly good when angry: Lydia Leonard) drives her increasingly frustrated husband into a new love for Jane Seymour (nicely innocent and docile: Leah Brotherhead). 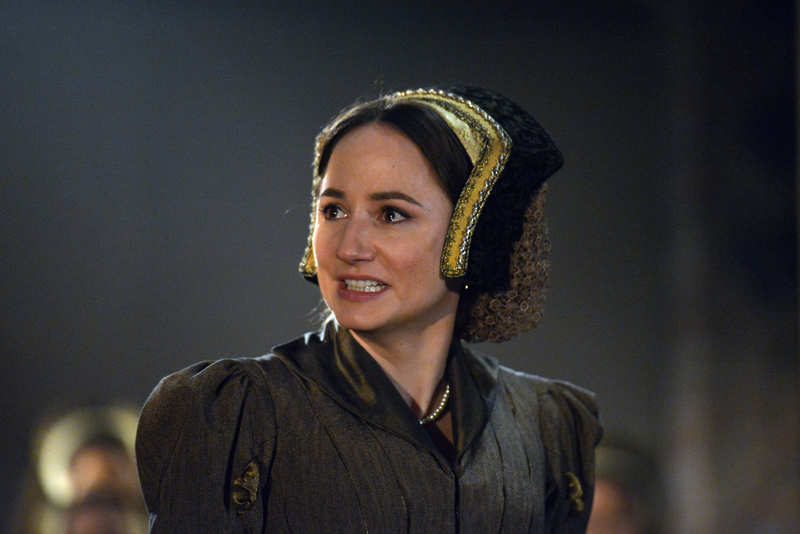 Anne Boleyn is in the way, a situation only Thomas Cromwell can resolve. Cromwell (Ben Miles) now is, next to the king, the most powerful man in the country. Miles meticulously portrays the utmost focus, in which this politician, by manipulation, charm and threats, pursues open and covert targets in order to satisfy his king, strengthen his and his family’s position and implement his personal revenge. Nathaniel Parker as Henry VIII lets the audience feel how the King’s self-confidence weakens, and how he transforms from a proud lover to a solace seeking heap of misery. Katherine of Aragon’s history comes to its conclusion – she dies whilst in house arrest. Lucy Briers gives her character the dignity of a truly strong woman. Life becomes dangerous for poet Thomas Wyatt (Jay Taylor), the King’s friend Henry Norris (John Ramm), and courtiers Weston (Piero Niel Mee), Smeaton (Joey Batey) and Brereton (Nicholas Shaw), as well as for Anne’s brother George Boleyn (Oscar Pearce). Their growing panic at being accused of adultery with Queen Anne builds up to an almost unbearable tension that only for Wyatt does not end on the executioner’s block . Just as in Wolf Hall, Ben Miles’s presence, overwhelming in its stillness, hypnotises stage and auditorium. The danger of Cromwell’s role, not least for himself, at all times shimmers through his radical measures and private conversations. Breathtaking! Putting Wolf Hall and Bring Up The Bodies on stage with such pure and unassuming artistry deserves massive kudos to director Jeremy Herrin. A massive success for the RSC and their Artistic Director Gregory Doran. Bring Up The Bodies will was shown in Stratford until 29 March 2014, subsequently, from late May to 4 October 2014 in London, at the Aldwych Theatre, and as of 20 March 2015 on Broadway, at the Winter Garden Theatre. This entry was posted in Theatre and tagged Anne Boleyn, Ben Miles, Daniel Fraser, Giles Taylor, Greg Doran, Henry VIII, Hilary Mantel, Jay Taylor, Jeremy Herrin, Joey Batey, John Ramm, Joshua James, Lucy Briers, Lydia Leonard, Matthew Pidgeon, Nathaniel Parker, Nicholas Day, Nicholas Shaw, Oscar Pearce, Paul Jesson, Piero Niel Mee, Royal Shakespeare Company, RSC, Stephen Warbeck, Stratford-upon-Avon, Swan Theatre, Thomas Cromwell on January 7, 2014 by lingonews. History from the eye of the hurricane, which is also a view into history’s engine room. 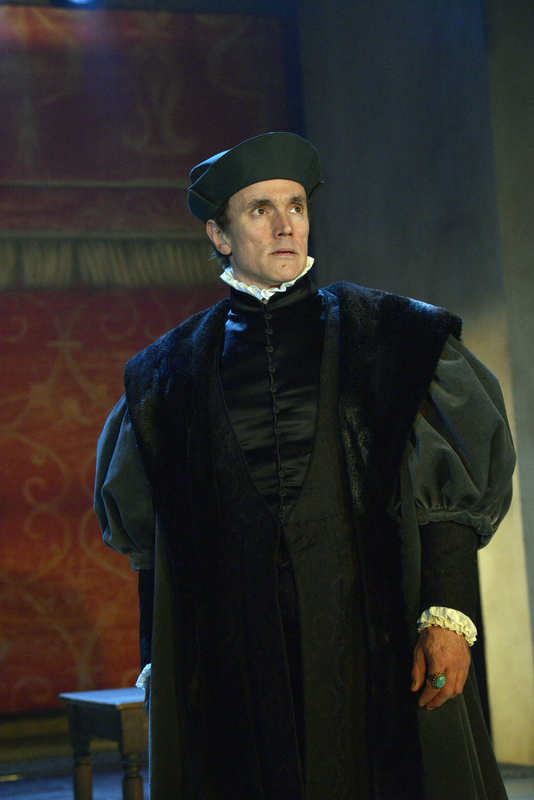 Thomas Cromwell, a powerful politician of lowly origins is turning the wheels. For quite a while, the world’s bigger picture develops according to his design: Henry VIII separates from Katherine of Aragon and marries Anne Boleyn, in which process, as a by-product, Reformation is implemented and the Anglican Church takes its course; Thomas More loses his office and his head; the world holds its breath. It is around the character of this Thomas Cromwell, who is only documented with regard to public events, that Hilary Mantel wrote Wolf Hall and Bring up the Bodies, two historical novels that both were awarded the prestigious Man Booker Prize. Compacted to play length by Mike Poulton, two dramas were created for the Royal Shakespeare Company. They are being performed in the Swan Theatre either individually or as a double bill. In this first part, fall and death of his mentor Wolsey and the loss of his wife and daughter are the most formative moments for Cromwell; the human being emerges behind the power figure, with actions as much emotional as they are pragmatic. 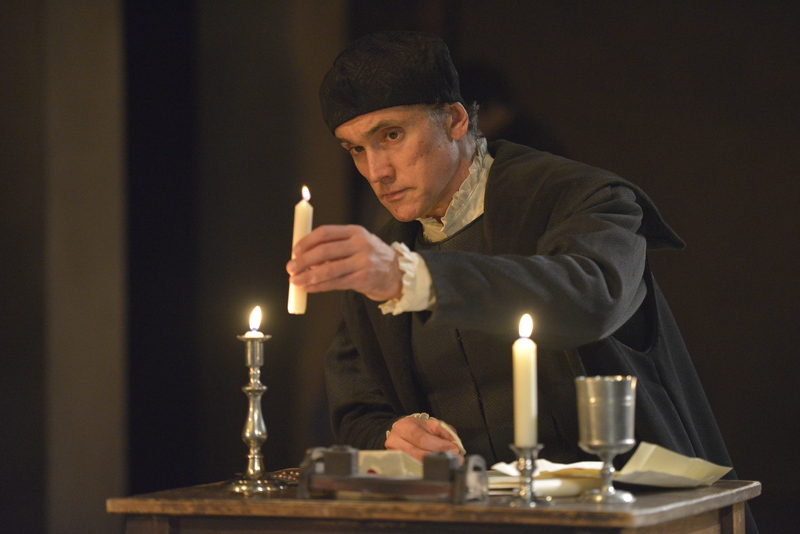 Leading actor Ben Miles seizes Cromwell’s multi-layered personality from within, as a silent person that often pauses and listens to the reverberations of emotions and developments. Miles gives shape to the political genius at all times interlocked with a precarious position of the man who, at times, was the most powerful man in England. A stage presence in a class of its own, with a marathonic performance in text and physical presence on stage. 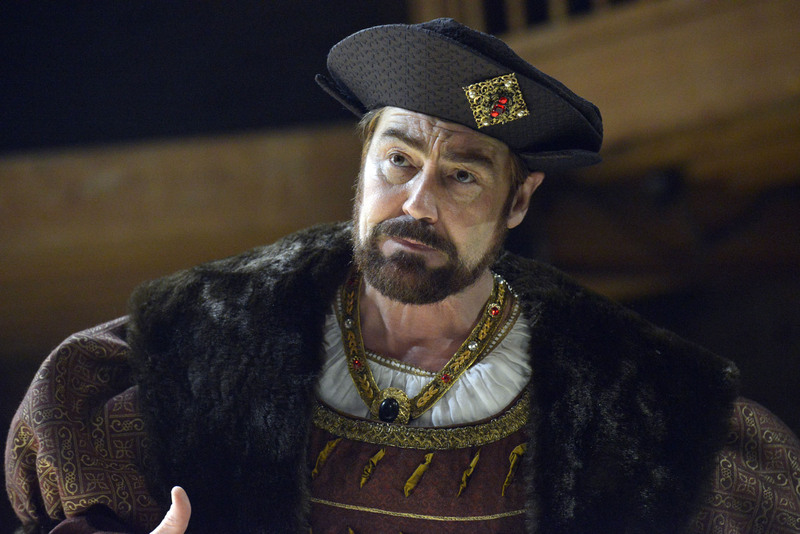 Nathaniel Parker as Henry VIII is the second lead. He depicts him highly intelligible as caught between confused godliness, the belief in his God given rights connected to the duty to father a male heir, and the drivenness in all too human weaknesses. This king, dangerous in his uncontrolled ways, becomes understandable, even somehow likeable to the audience’s eyes. Henry’s first wife, Queen Katherine (Lucy Briers), appears as the voice of reason, and despite all humiliations, she pursues an approach of wisdom. 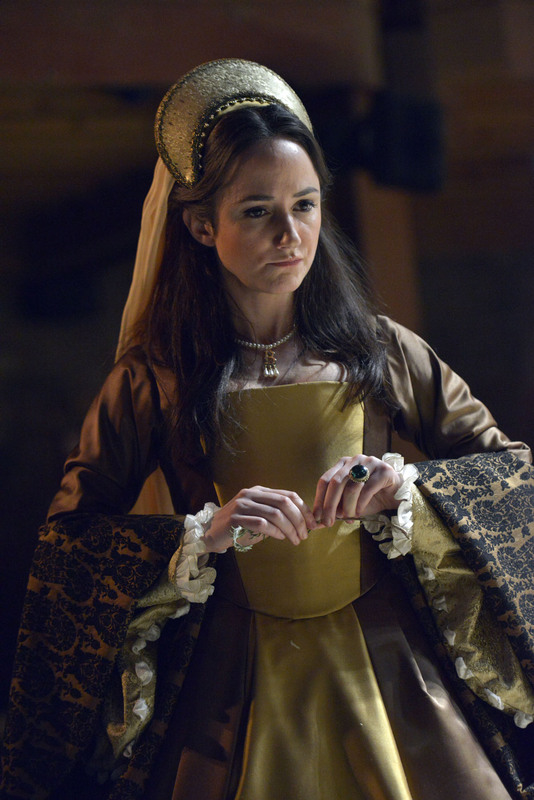 Coquettish, playful and flirtatious, where she doesn’t spit hatred, Lydia Leonard as Anne Boleyn, for a while is the pivotal and focal point at court. Powerfully, Leonard leads her character to the climax at her coronation, thus – and palpable in a glimpse – already almost to the verge of the abyss. Also remarkable: John Ramm as Thomas More, the unchristian saint, who didn’t fall due to his torturing fanaticism but because of being true to a rather harmless principle. Hilarious: Oscar Pearce as Anne Boleyn’s quirky brother George. “Uncle Norfolk” is presented by Nicholas Day just as you had imagined him when reading the novel, and the performance by Nicholas Shaw as Harry Percy, Earl of Northumberland also deserves a special mention. A smaller, but very particular highlight is set by Piero Niel Mee with his interpretation of Christophe, a French guttersnipe, Cromwell’s alter ego, adopted into his household by the man himself. A clever and sensitive performance in a small part, one can only hope to see more of this young man in the future. Wolf Hall will was shown in Stratford until 29 March 2014, subsequently, from late May to 4 October 2014 in London, at the Aldwych Theatre, and as of 20 March 2015 on Broadway, at the Winter Garden Theatre. This entry was posted in Theatre and tagged Anne Boleyn, Ben Miles, Daniel Fraser, Giles Taylor, Henry VIII, Hilary Mantel, Jeremy Herrin, John Ramm, Joshua James, Lucy Briers, Lydia Leonard, Matthew Pidgeon, Nathaniel Parker, Nicholas Day, Nicholas Shaw, Oscar Pearce, Paul Jesson, Piero Niel Mee, Royal Shakespeare Company, RSC, Stephen Warbeck, Swan Theatre, Thomas Cromwell on January 6, 2014 by lingonews.